This guide is a work in progress. It will be updated as the journey continues. A normal human leg consists of a femur in the upper leg connected to the hip and a lower leg consisting of a tibia and a smaller fibula connecting to the small bones in the foot. Joining these is a knee joint with a patella bone. Tibial Hemimelia (Missing or underdeveloped tibia) and the similar Fibular Hemimelia (Missing or underdeveloped fibula) are birth defects in the bones of the lower leg. The patella may be missing. The foot may have missing or deformed bones and toes. The foot is almost always flipped up. My daughter Lulu was born with Tibial Hemimelia (TH), so rare a condition that it is present in only one-in-a-million live births. Compare this with Down Syndrome at approximately one-in-a-thousand. Even rarer at one-in-three-million is the bilateral (affecting both legs) form. She could not walk. Instead, she moved around on her knees. Disjointed fibulae and inverted feet. Two toes on one foot. Forked femur visible on the right leg. Lulu had her left leg placed in an external fixator. The fixator is used to move the fibula into the position where the tibia would have been. With the fixator on, the fibula can move up to 1mm per day. This slow movement allows the soft tissues to stretch and heal without damaging them. The external fixator is lengthened by turning screws on each strut. Pins and wires provide tension on either end. An internal wire ties together the foot and the lower part of the fibula so fibula moves away from the knee. 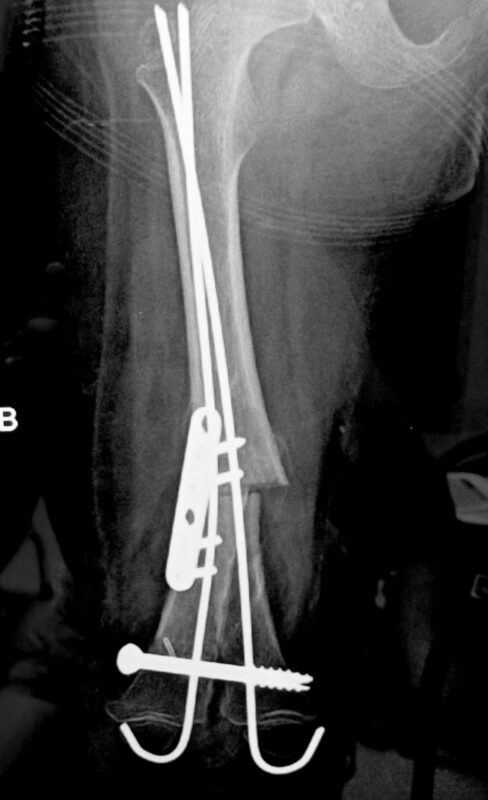 Once the fibula is in position, it will be used as a replacement tibia. The patella will be cut into two pieces. The smaller piece will be left behind to grow a new one. The larger piece will be flipped and fused to the top of the fibula, forming a superior bone ending. A knee (re)construction is then performed to make a functioning knee. 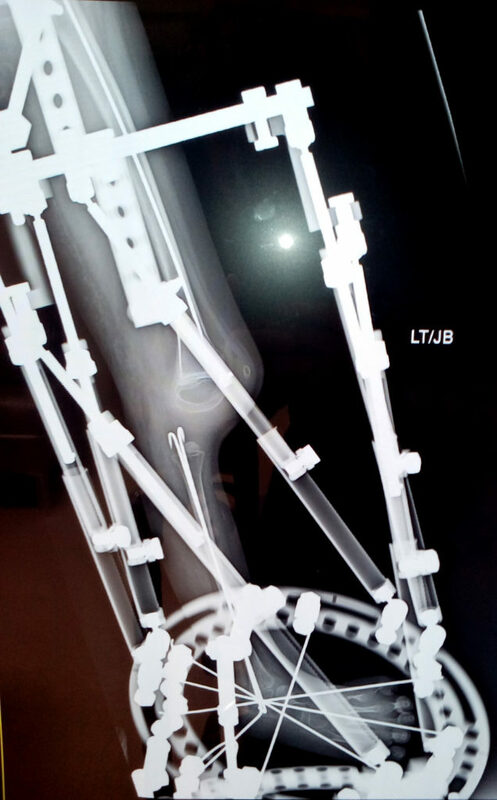 X-Ray of external fixator on left leg. The fibula is almost in the final position, having traveled about 1.5 inches away from the femur. The wires holding the foot and fibula are visible. The patella is visible as well. The foot as been partially flipped. Her right leg lacked a proper quadriceps to provide a sufficiently functional knee joint so we were forced to choose amputation. The Y-shaped femur was cut and the two condyles brought together to form a larger bone base. The purpose is twofold: straighten the leg and provide a better fit for the prosthetic. X-Ray of amputated right leg. The Y-shaped leg was straightened by splitting the forked femur and bringing the ends together to form an I-shape. 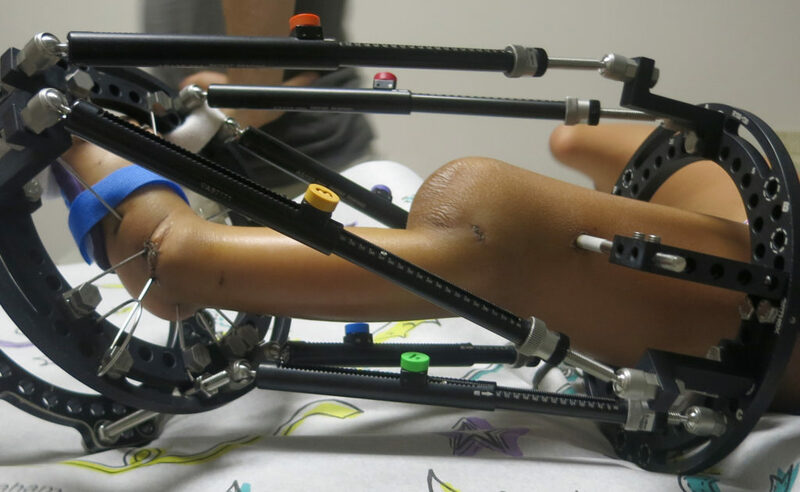 At this stage of treatment she is able to walk by herself on her fixator using a reverse walker. It is the first time she has ever been able to walk unassisted by another person. 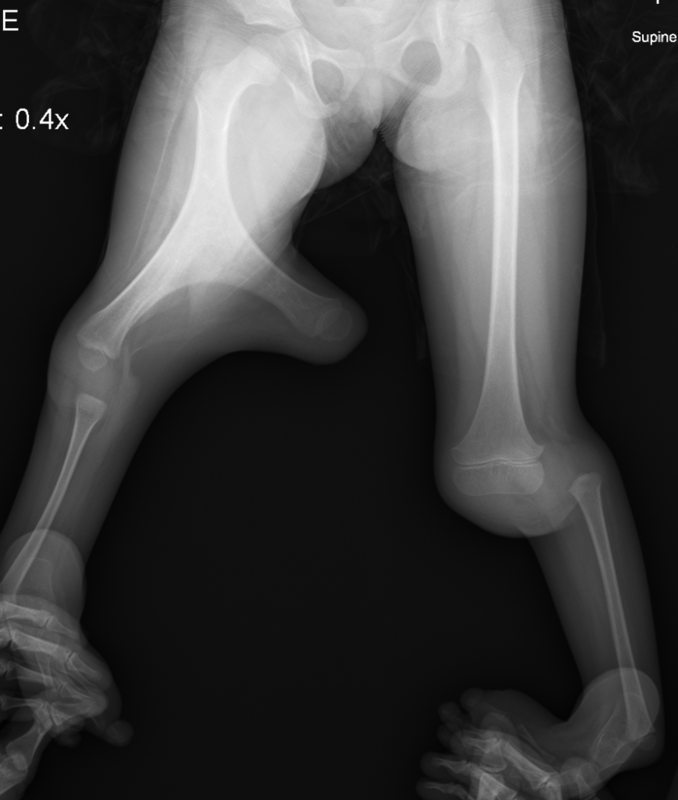 Pediatric Lower Limb Deformities. Chapter 24: Tibial Hemimelia. Dror Paley and David Y. Chong. Springer. Treatment Strategies for Tibial Hemimelia. Dr. Dror Paley. The Paley Institute (2016). ¹ It is still considered controversial in polite society to suggest that the default treatment for FH and TH should be to attempt limb salvage, rather than amputation. Few doctors will even mention any other possibility. In these cases fully informed consent only happens for those who do their own research. Making this suggestion will result in statements about how great prosthetics are, bans from topical groups and forums, hateful comments, and other similar bad behavior. As such Dr. Paley, as well as those who advocate for limb salvage, will take heat for trying to avoid amputation. Please see the Treatment Options for Tibial Hemimelia for more information on the decision making factors.